As part of the ongoing work to complete the commemorative displays in relation to the RAF’s 100th Birthday in 2018, there has been a significant re-shuffle in the RAF Museum’s collections. This website has already provided regular updates while the Battle of Britain collection was dismantled and re-located at Hendon and I have watched with interest as further aircraft moves take place in order to make room for the interactive RAF 100 exhibition. I hope to visit Hendon before the year is out in order to provide a further update from that site. It has to be said though, based on what I am hearing and seeing the London site really seems to have lost a great deal of exhibits which is a real shame as the most recent addition, the WW1 display, is one of the greatest aviation museum’s in the country. While Hendon may be going through an interesting and perhaps disappointing change for many, Cosford really impresses. Having seen a few pictures here and there of some of the relocated airframes on display I hadn’t really gathered the full picture of the changes that have been undertaken in the last few months. The first thing that hits you on arrival is the rather sad sight of the Catalina on external display. 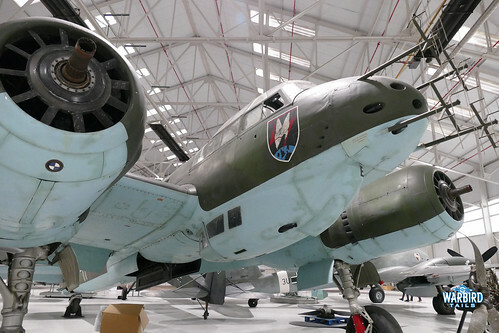 This airframe was undercover in the War In the Air hangar until the recent arrivals from Hendon joined the collection. Despite the obvious preservation challenges of external display it is impressive to see the amphibian out of the confines of the hangar. The war in the air hangar has had a significant shuffle since my last visit in 2016. 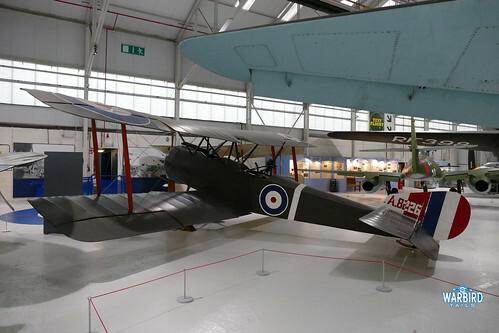 The WW1 area remains unchanged with the Sopwith Pup and Strutter joined by the Bristol M1C. 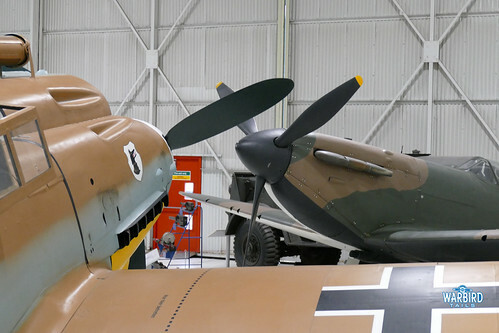 The Spitfire and Hurricane have now been joined by the Boulton Paul Defiant (largely complete at the time of my visit) and Gloster Gladiator (sadly squeezed into a slightly dark corner). Across the walkway from the RAF fighters the opposition is very literally displayed. 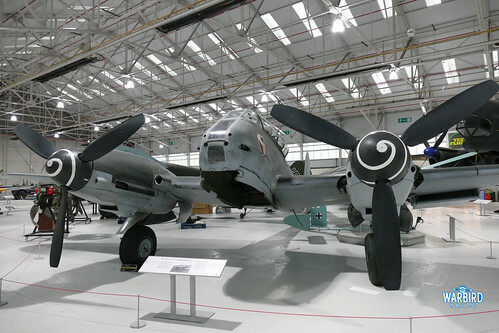 BF109G Black 6 takes pride of place having relocated from Hendon earlier this year. 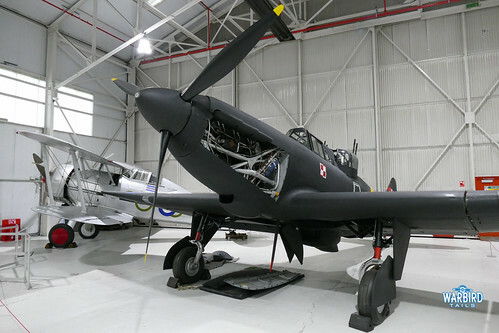 Black 6 was one of many airframes on display with their canopies open. This made for some different views to the normal museum options. 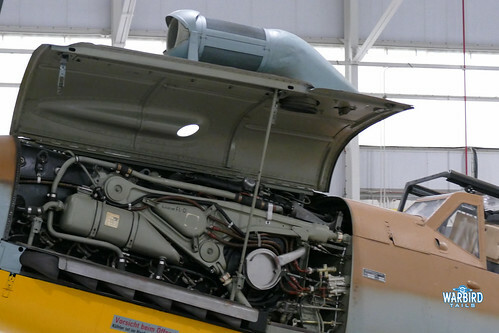 The 109 also had its distinctive cowling open revealing the Daimler-Benz engine underneath. In a great later war pair the 109 is joined by the Focke-Wulf 190. 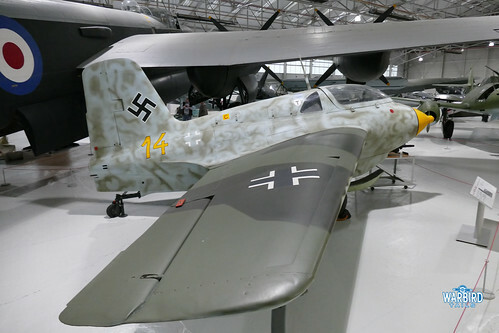 The Luftwaffe theme continues in the shape of recent arrival Junkers JU88. The aircraft is still awaiting the finishing touches of assembly but it certainly makes a change to see this airframe in a different location. 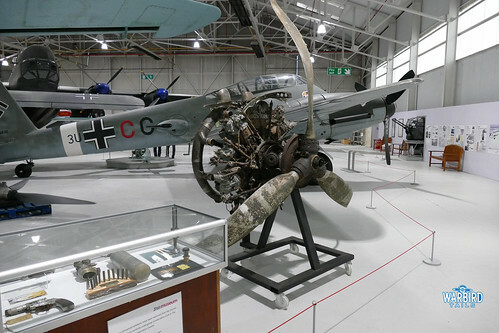 Next to the JU88 are the first parts of the DO17 to go on display, with both propellers and a significant portion of an engine alongside some other smaller parts. Another Messerschmitt completes the piston engined portion of the Luftwaffe collection (Storch aside), this time the ME410. This is one of the aircraft to have relocated in the hangar and a much better view is now offered. Another two Messerschmitt airframes round off the line-up with the ME262 (another recent arrival from Hendon) and ME163 Komet sitting opposite each other. While I was fully aware all of these machines were on display at Cosford I had not really registered how impressive they would all look displayed together. 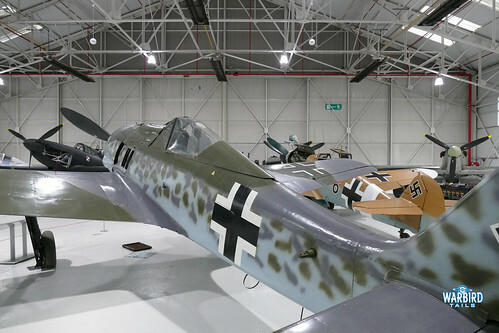 While the Battle of Britain collection has been broken up this impressive later war Luftwaffe line-up has really added a lot to Cosford’s appeal. I’ll be putting together another post later this week taking a look at the wider Cosford collection as I don’t believe I’ve ever featured the museum as a whole before.